CORMIX is a USEPA-supported methodology for simulation of turbulent buoyant jet mixing behavior which covers a majority of common discharge and environmental conditions. It classifies momentum and buoyancy of the discharge in relation to boundary interactions to accurately predict mixing behavior. Boundary interactions can be flow surface or bottom contact or terminal layer formation in density stratified ambients. The flow trapping shown in the images on the right are indicated by a CORMIX1 S flow classification. This trapping behavior can sometimes be ecologically desirable and attainable with appropriate outfall design. The hydrodynamic simulation system contains a collection of regional flow models based upon integral, length scale, and passive diffusion approaches to simulate the hydrodynamics of near-field and far-field mixing zones. Efficient computational algorithms provide simulation results in seconds for mixing zone problems with space scales of meters to kilometers and time scales of seconds to hours. 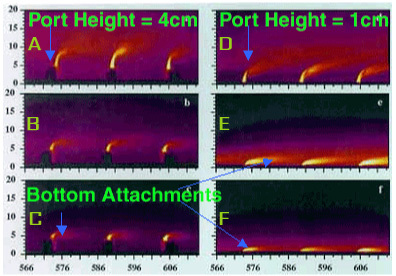 Ambient density stratification causes boundary interaction behavior and produces a terminal layer and subsequent density current formation for this single port discharge in a stagnant ambient. (Image Source: Hofer, Kurt (1978) - Eine verbesserte Theorie turbulenter Freistrahlen im stratifizierten Medium und ihr Vergleich mit dem Experiment. Mitteilung VAW-ETH No. 31). 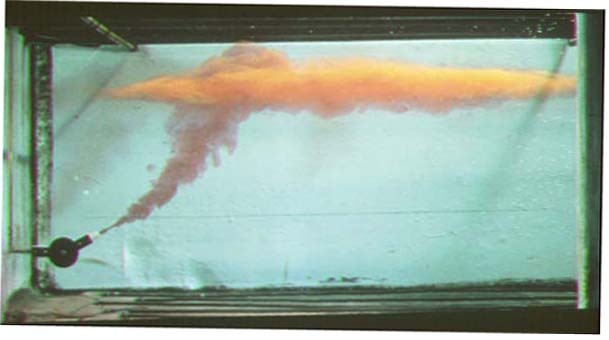 A CorVue 3-D visualization of near-field plume trapping boundary interaction and upstream density current formation in a stratified crossflow (enhanced image). The CORMIX methodology emphasizes the role of boundary interaction on mixing. Plume boundary interaction defines the transition from near-field to far-field mixing. Boundary interactions can be in the form of near-field wake or Coanda attachments, stratified terminal layer formation, or contact with the water surface or bottom. The hydrodynamic simulation system executes a series of regional flow prediction modules for both stable and unstable near-field mixing processes. 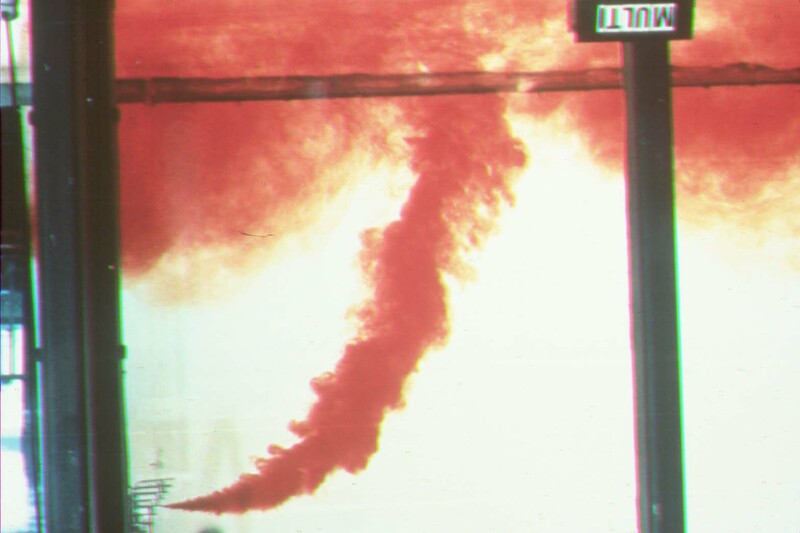 This buoyant jet shows near-field dynamic plume attachment, and lift-off followed by unstable mixing in the near-field (Source: Unknown). The advanced tools release, CORMIX - GT, gives the analyst powerful new tools for mixing zone analysis and visualization. 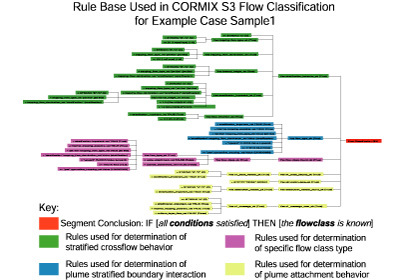 CORMIX is an easy-to-use rule-based expert system has an extensive development history. This state-of-the-art system has been applied by over 4000 environmental professionals worldwide since 1988. The CORMIX rule bases integrate with visualization and design tools to form a complete system for outfall design and mixing zone optimization. The set of false-color laser-induced fluorescence (LIF) images on the right illustrates boundary interaction behavior for a multiport diffuser in crossflow. 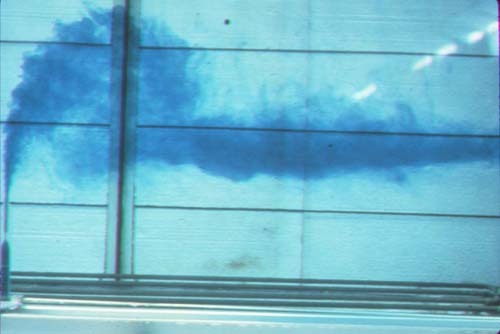 Crossflow velocity (left to right) is increased from top series (a, d) to the bottom (c, f) causing plume wake attachment (c, e, f). The greater discharge port height on the left (a, b, c) resists bottom attachment as crossflow velocity increases. Near-field wake attachment in a multiport diffuser (Photo: S. Monismith). 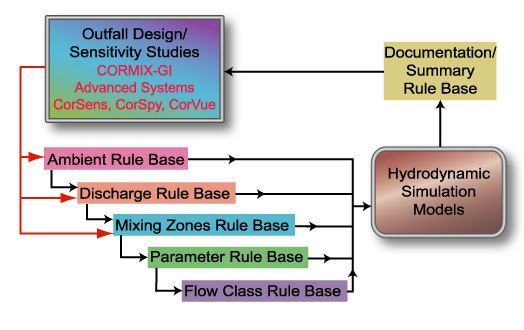 CORMIX consists of a rule-based flow classification system (set of rules) about mixing zone analysis linked to a series of hydrodynamic simulation models, visualization routines, and outfall design tools. The system uses length scales to categorize boundary interaction processes which control mixing zone stability. Flow near-field dynamic attachment processes are also simulated. The complete scheme contains over 100 distinct flow classifications of plume behavior and boundary interaction processes for a rigorous analysis of mixing zone characteristics. The classification also assists in evaluation of regulatory mixing zone requirements and facilitates outfall design optimization. The CORMIX hydrodynamic classification scheme for single port discharges in uniform ambient density layers (larger image). The rule base provides a rigorous, descriptive, and documented analysis of mixing process for both regulators and dischargers. An example of a rule appears in the image on the right. The complete rule base contains over 2000 rules to analyze the spatial and technical requirements for regulatory mixing zones, including evaluation of water quality standards. The system uses both forward-chaining (inductive logic) and backward-chaining (deductive logic) reasoning strategies to analyze mixing zone behavior and document regulatory compliance. Within the system, several advanced artificial intelligence (AI) and computer-aided-design (CAD) software tools are available to assist the analyst in mixing zone prediction. The system relies on a rule-based classification system to predict hydrodynamic mixing zone behavior and document regulatory compliance. 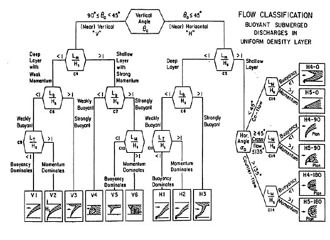 The image on the right shows flow classification rules. Other rule base segments check for input data consistency, analyze regulatory requirements, and give advice for outfall design optimization. An example of one IF-THEN rule from the flow classification rule base (larger image). 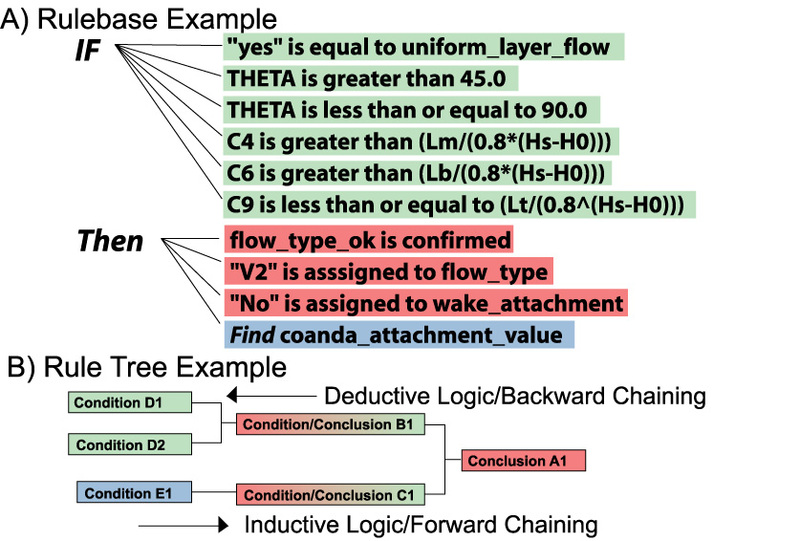 The rule-base browser of CORMIX shows the entire rule tree of IF (conditions) - THEN (conclusion) rules used in the flow classification segment (larger image). The flow classification (conclusion in red) depends upon the conditions (green, blue, magenta, yellow). CORMIX simulation documentation consists of text, tables, diagrams, and visualization graphics. Several advanced software systems facilitate rapid and complete mixing zone analysis. CorSpy provides interactive 3-D rendering of outfall and boundary geometry. CorVue gives interactive 3-D visualization of regulatory mixing zone requirements for water quality standards such as CCC and CMC values. CorSens automatically generates mixing zone predictions for sensitivity studies of ambient and discharge conditions. CorDocs - Complete online hypertext documentation of CORMIX1, CORMIX2, and CORMIX3 Technical Reports. CorData loads legacy DOS data files. CorJet provides detailed near-field mixing for stable flows in arbitrary ambient density and velocity fields. FFLOCATR can reconcile field study far-field data with schematized CORMIX predictions. 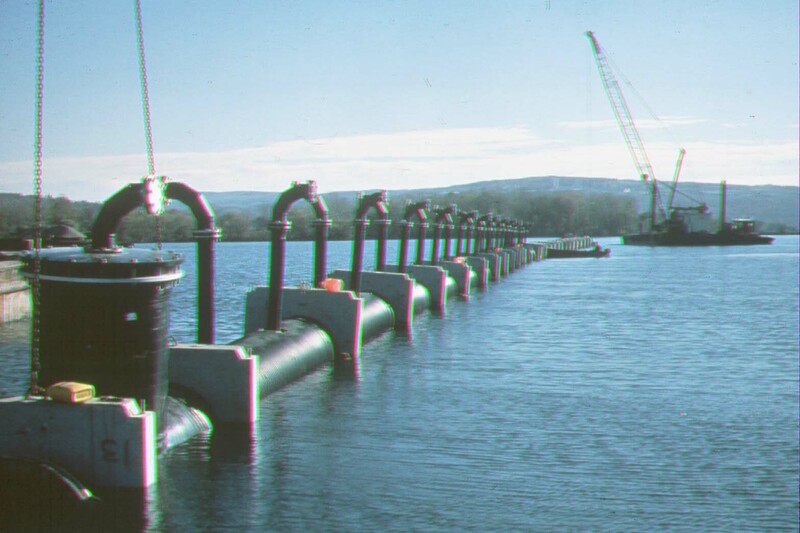 A modern multiport diffuser outfall under construction on Lake Cayuga, New York. This 30-m long diffuser has alternating ports designed to limit creation of discharge induced ambient currents. (Photo: G. Jirka). The CorSpy Computer Aided Design (CAD) tool can assist in muliport diffuser design optimization (larger image). CORMIX has 3 discharge subsystems which depend upon source discharge characteristics. These subsystems are listed below. 1. CORMIX1: Single Port Outfalls CORMIX1 deals with single port discharges into flowing unstratified or stratified water environments, such as rivers, lakes, estuaries, and coastal waters. It includes the limiting cases of non-buoyant and negatively buoyant discharges and of stagnant ambient conditions. It also deals with tidal reversing flow conditions and arbitrary ambient current and density profiles with CorJet. An ambient density-stratified crossflow causes boundary interaction and produces a terminal layer and subsequent density current formation for this single port submerged discharge (Source: Unknown). 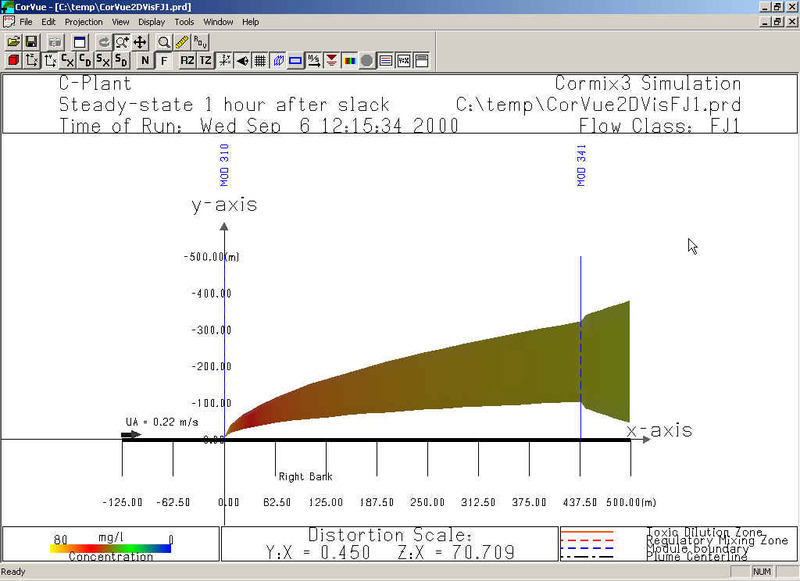 A CorVue 3-D visualization of a CORMIX1 S4 flow classification, similar in stratified crossflow mixing behavior as shown in the laboratory image on the left (enhanced image). 2.CORMIX2: Multiport Submerged Outfalls Subsystem CORMIX2 deals with submerged multiport diffuser discharges into similar environments and with similar limiting cases. Unidirectional, alternating, and staged diffuser types are simulated by the system. 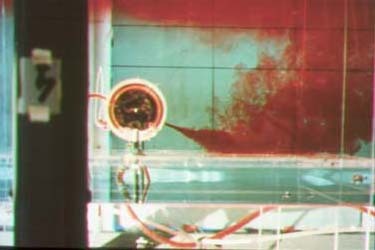 One nozzle is dyed in this experiment with a mulitport unidirectional diffuser (Photo: G. Jirka). 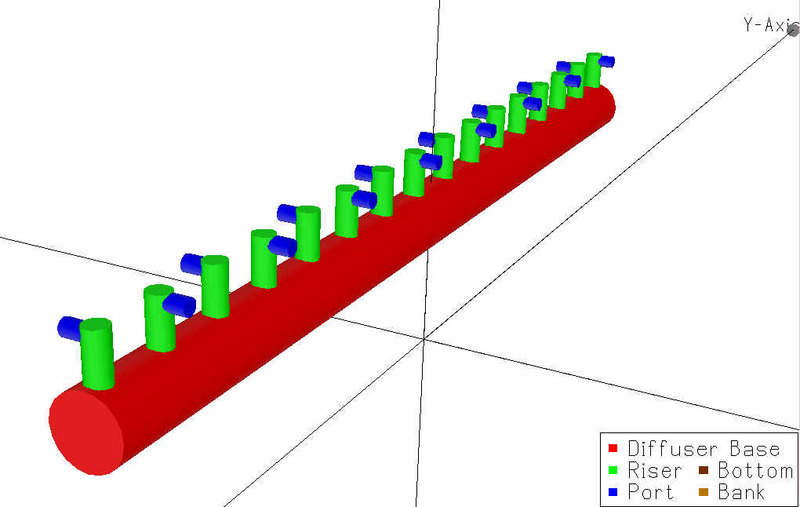 A CorVue 3-D visualization of a multiport MU1V flow classification showing boundary interaction in the near-field, surface density current upstream intrusion and stagnation point (enhanced image). 3.CORMIX3: Surface Buoyant Discharge Subsystem CORMIX3 deals with buoyant surface discharges into similar environments. However, it is constrained to positively buoyant (or non-buoyant) discharges. CORMIX-GTS extends CORMIX3 to negatively buoyant surface discharges. 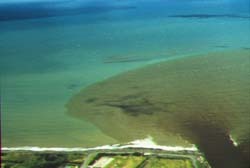 An example of a tributary mixing zone from a surface discharge into a coastal environment. Note the formation of an intruding upstream density current, a process predicted by CORMIX3. (Photo: I. Wood). A CorVue 2-D x-y plot of a FJ1 surface buoyant jet.